Flour is a staple ingredient in bread, of course, but so much more besides; think biscuits and brownies, pastry and cakes, pizza, pancakes and puddings, even quietly playing its part as a subtle addition to something as simple as a white sauce. It’s the ultimate easy ingredient; long-lasting, cheap and filling. Flour also falls into a food group that has had a pretty bad press of late. Increasingly people are going on low carb diets, cutting out their daily sandwich or slice of toast in an attempt to channel their inner Atkins and shed some excess pounds. You may have guessed I don’t subscribe to this group – I prefer to enjoy a bit of everything I want in moderation – but for these people who do cut out carbs, it’s a decision they choose to make. Some people don’t have that choice. One such person is a school friend of mine who was diagnosed with coeliac disease a few years back. This isn’t just an allergy or food intolerance, it’s a fully blown autoimmune disease where a reaction is triggered by the gluten found in wheat, rye and barley. It’s something people live with every day, but is definitely not to be taken lightly, especially when you cook in the kind of kitchen where crumbs are commonplace and the cupboards are bulging with bags of flour . . .
With my friend in mind I started reading about the kinds of gluten-free desserts I might be able to make. Plenty still contain flour in some form – and I discovered some amazing recipes involving flours made from rice or potato, chickpea, buckwheat, corn, millet, peanut and more (for some incredible gluten-free recipes, I’d recommend visiting www.cannelle-vanille.blogspot.com) – but in the end I decided to bake something completely flour-free; a decadent dessert with few ingredients and a celebration of baking without flour that would be impressive yet understated in its elegance. The result is this two-tiered flourless chocolate mousse cake. Taken from the Green and Blacks Chocolate recipe book, it’s the ultimate chocolate lovers’ delight. A slab of dense, fudgy, flourless chocolate cake is chilled then topped with a layer of intensely rich chocolate mousse. Served in thin slices with a chilled mint crème anglaise, this decadently dark dessert is velvety and seductive, smooth and sweet and utterly delicious. You wouldn’t even think to miss the flour. No-one quite knows why this celebratory confection is called a marquise, but some have suggested it was named for the 18th century aristocrat the marquis de sade. Known for his libertine lifestyle and love of all things chocolate, he was said to love the stuff so much, he even made his wife bring him packages of it when he was in prison. I don’t know the truth of the story, but if I was locked up, this dessert would come pretty high on my list of requests. What foods couldn’t you live without? And have you ever tried? Preheat the oven to 180 degrees C. Brush a 23cm loose bottomed tin with melted butter. Melt the chocolate, caster sugar and butter in a large heatproof bowl suspended over a saucepan of barely simmering water. Set aside to cool slightly. Beat the eggs with the ground almonds and salt, then stir into the chocolate mixture, continuing to fold until rich and glossy. Pour into your prepared tin and bake for 35-40 mins. Remove from the oven and set aside for at least two hours before you start the next stage. Melt the chocolate. Remove from the heat then stir in half the icing sugar, along with the butter, until smooth and glossy. Whisk in the egg yolks one at a time then set aside. Whisk the egg whites until stiff peaks form, then add the other half of the icing sugar and continue to whisk until glossy. Whip the cream until stiff peaks form. Carefully fold one third of the egg whites into the chocolate mixture. Gently fold in the remaining whites, alternating with the cream until a smooth mixture is formed. Do not overmix, but make sure it is well blended. Pour the mousse over your cooled cake base in the tin and refrigerate overnight. Bring the cream to the boil in a small saucepan with the mint leaves. Remove from the heat and leave to infuse for 15 mins. Whisk together the egg yolks and sugar until thick and creamy. Strain the cream so all mint leaves are removed, then reheat until almost boiling before whisking into the egg mixture. Return the mixture to the saucepan and gently heat, stirring continuously until it thickens to a custard. Remove from the heat and leave to cool, stirring in a little crème de menthe to taste if you like. To serve the cake, remove from the fridge about 15 mins before you want to eat. Slide out of the tin and smooth the edges with a palette knife dipped in boiling water. Cut into thin, rich slices and serve in a puddle of creamy green custard. *If making this cake for a gluten-free friend, double check the chocolate you are using. My friend, for example, is ok with Green & Blacks, but can’t eat Bourneville or Lindt. This November Sally at My Custard Pie is hosting a Monthly Mingle around the theme of custard. This mint crème anglaise felt like the perfect participant, so I’m submitting it to join in her celebration of all things custard. Check out the link above for more custard-based dishes from 30th November! That looks fab – I’d be delighted if I was your friend. Love the colour of the custard. I think I’ve made this version before for my dad who is also a coeliac, it’s delicious! As much as I love flour, I do quite often prefer flour-less desserts myself. There’s something about flourless brownies and cake which are just more rich and decadent! Flour is just one of those things that we can’t imagine not existing. So much of the past couple of thousand years has hinged on the eating of bread etc… However, it’s nice to have a change – besides flour makes you fat. This is an awesome recipe, no less than I’ve come to expect :D. I do like a good bit of custard. wow that looks delicious, I looove chocolate cake!!!! This looks so scrumptious, it’s hard to imagine that it’s gluten free. Fabulous and love the addition of the mint to accompany the pleasure. Hm. No wonder the Marquis wanted this in prison! Had no idea the the Marquis de Sade was so fond of chocolate – not sure I feel too happy about that 😉 Your marquis looks delicious though and the mint cream makes for an unusual accompaniment. It must be so very tough being a coeliac – one of my friends lives of brown rice, meat and veg ant very little else. Much as I love chocolate, I would hate not to be able to have wheat and rye. Strangley, I’m less bothered about cakes as there are plenty of alternatives out there and ground almonds work really well, but no bread ahhhhhh! Gin & Crumpets – it’s very lurid isn’t it? Think I probably could have got away with posting this as a Halloween recipe too! Lorraine – haha, yes he does have a reputation for certain other things! 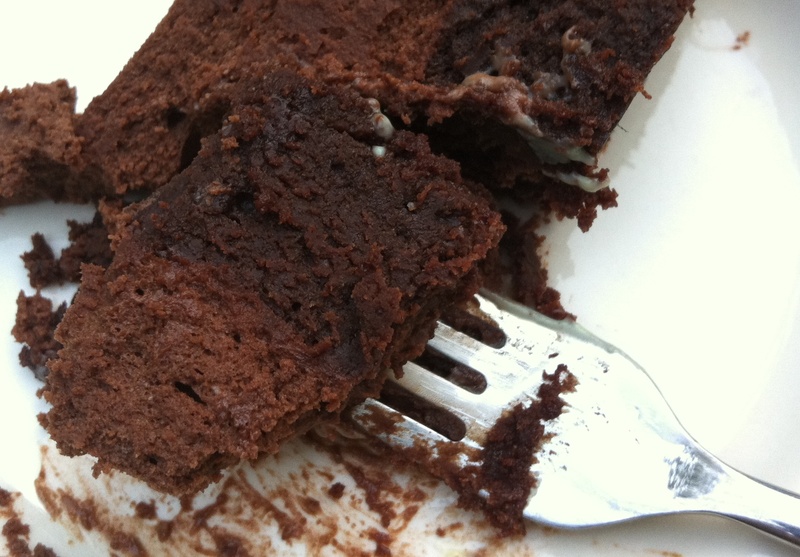 Kathryn – absolutely agree, sometimes chocolate cakes made with too much flour just aren’t chocolatey enough! Frugal Feeding – haha, flour makes you fat but 550g of chocolate doesn’t? 🙂 I know what you mean though – the extra custard seems like an indulgence but actually helps to cut through the richness of the cake. Jill – mint and chocolate is such a great combo, preferably enjoyed outside of prison! This looks amazing! I love the mint creme anglaise… it just so fancy! Miss South – I’m with you all the way. My boyfriend is always going on crazy carb free diets, but I’m a bread and pasta kind of a girl…a meal with no carbs always feels a little lacking for me. Julia – I’ve had the Green & Blacks book for years too and have only just got around to making lots of the recipes – must remember that they are seriously good, and easy to make! Celia – aw, glad you liked 🙂 Looking forward to making lots more fabulous gluten free food for you at our next lunch! Liz – definitely have a go at making it, it’s so delicious. Mmmmm this looks positively sinful!!! It’s not surprising to here the marquis de sade might have been responsible for this! I love the mint creme anglaise. Chocolate and mint go so well together. This looks really, really good – dense and chocolatey. I don’t think I could live without chocolate. I have tried but not for long. Mmmm, yum! 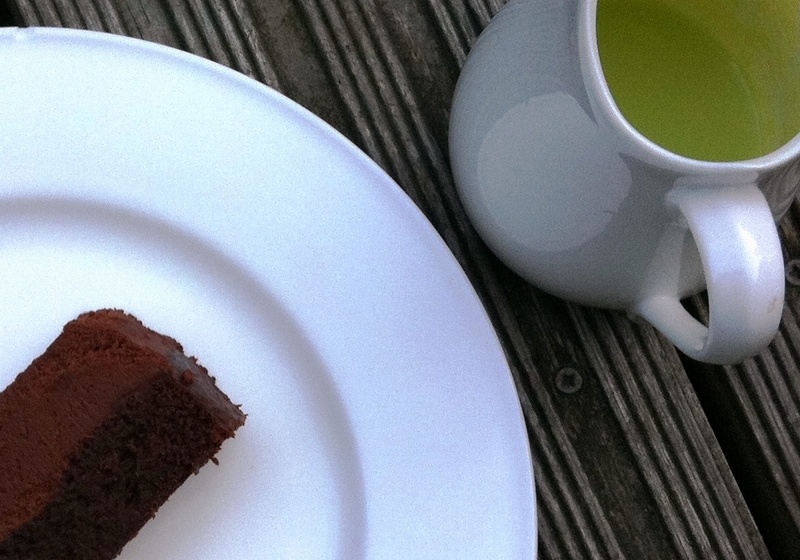 I love anything that combines mint and chocolate, and I’m also partial to a flourless cake. 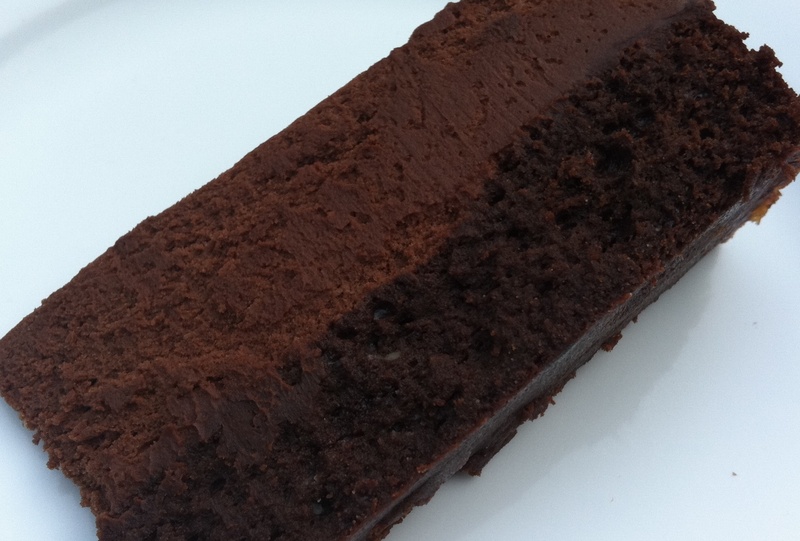 Anna – I agree, sometimes flourless desserts are the moist dense, fudgey and delicious! Jennifer – chocolate and mint is such a delicious combination! Gluten Freezen – there are so many incredible flours out there made without wheat…I love experimenting with new flavours and definitely want to vary my baking more. Baking Addict – haha I definitely couldn’t live without chocolate either! Paula – glad you like! I tried to think of a more poetic, less coarse way of putting this, but I couldn’t. Essentially, “this cake looks FIT”. Also, the flour-free thing is something I’ve been thinking a lot about lately. Sometimes I do feel like I’ve been consuming too much flour – it makes me feel a bit sluggish and tired and fat. But I do wonder how much of this is totally in my head because of the bad press you mentioned about carbs and the like. It’s a shame. Especially when you go on foodgawker and the like and see so many recipes boasting about being “Grain free” as if this is a real positive. I can’t imagine a flour-free diet, though, and definitely agree with you about everything in moderation. (Obviously I’m talking about people who can eat flour, not people who can’t for real allergy/dietary reasons). This looks devilishly good!! 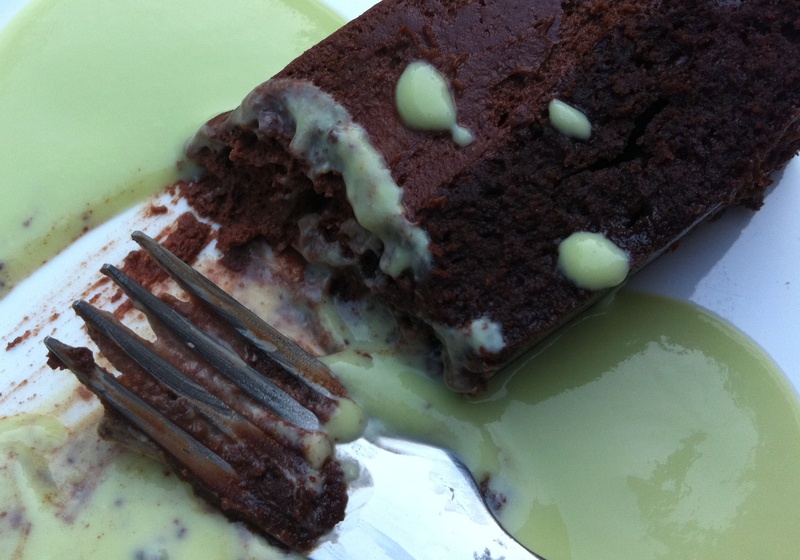 The mint creme anglaise looks like just the thing to cut that rich chocolate. This looks amazing – it looks like it could fix the most serious chocolate craving just by looking at it!! I gave up tea once…for a day. Custard would also be hard to live without – love your version here. This two layered chocolate marquise looks fabulous, the mint creme anglaise sounds like a great accompaniment too. Great post. Elly – haha, you said it. This cake IS fit 🙂 As for the carbs thing, they definitely do bloat you and can make a lot of people feel really sluggish, but I love them too much not to eat some in moderation. It is a shame that carbs have been so victimised by twenty first century life…having said that, with the current British obsession for baking, I don’t think they’re going away forever. Katherine – the custard really helps cut through the rich, dark chocolate. Sally – I’m not a huge fan of tons of really thick custard, but this delicate creme anglaise was delicious with the cake. Stunning and such a lovely texture for the MArquise. I like the idea of mint in the Creme Anglaise- makes it somewhat lighter to digest I imagine! wow! love the texture! chocolate and mint is a memorable combination. love the idea of mint in a creme anglaise! The Marquise was a Daring Bakers challenge a few months ago, but I couldn’t take part due to pior commitments. Seeing your creamy, fudgy Marquise is tempting me to have a go at it! Beautiful! Baker Street – the texture combination is gorgeous – dense cake, velvety mousse and creamy custard. Lisa – you should definitely give it a go. And you could always make just one layer if you’re pushed for time. I couldn’t live without chocolate, and yes I’ve tried. I gave up sugar for about 2 months and it was the one thing I missed the most! Yum. What a combination of flavors and scrumptious recipe. What a lovely post! I enjoyed reading it all! And about the recipe – it’s superb, fantastic delight! I especially like the flavoured custard recipe! Thanks for the lovely comment on my space.You have a wonderful recipe collection and photos.This combination is definitely a must try..
Hi, I’ve just made the torte part and it has cracked badly on top. I know it’s going to be covered up, but is this a problem? It smells amazing!! Sorry, I’m probably too late to this comment but that’s absolutely fine – just dust a little cocoa over the top, it should still taste delicious! Without being there it’s hard to know, but possibly your oven was a little bit hot?